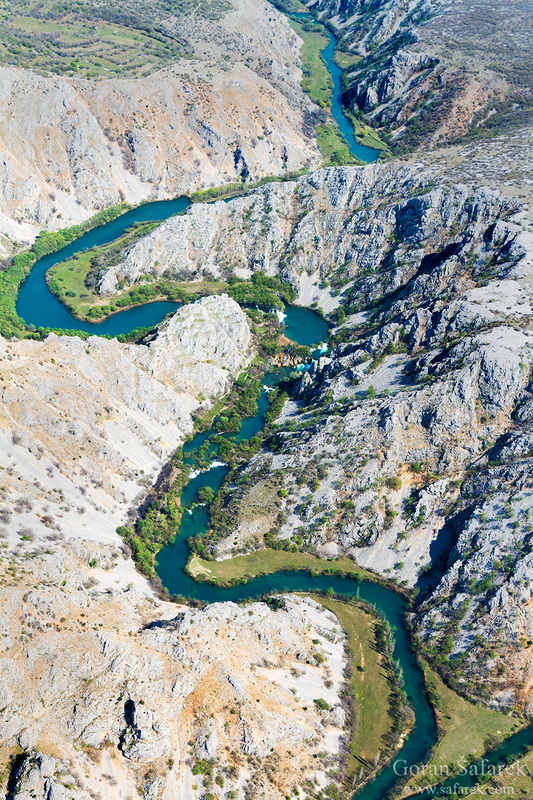 The wild beauty of the Krupa River - Explore Croatia Become a Patron! 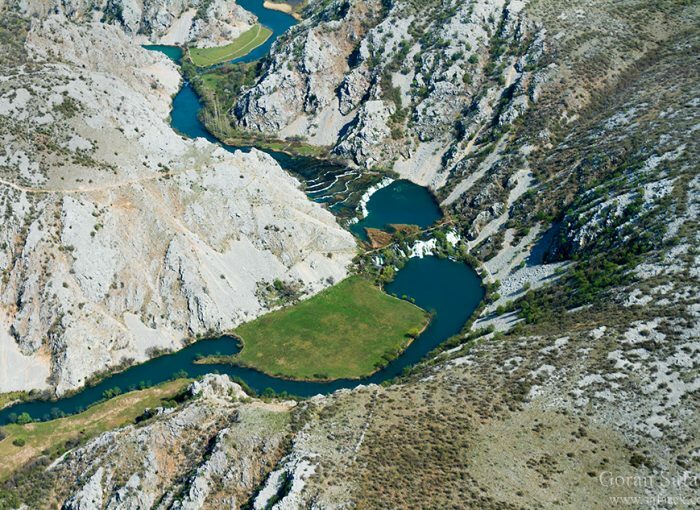 The Krupa River is the longest and richest confluent of Zrmanja River. 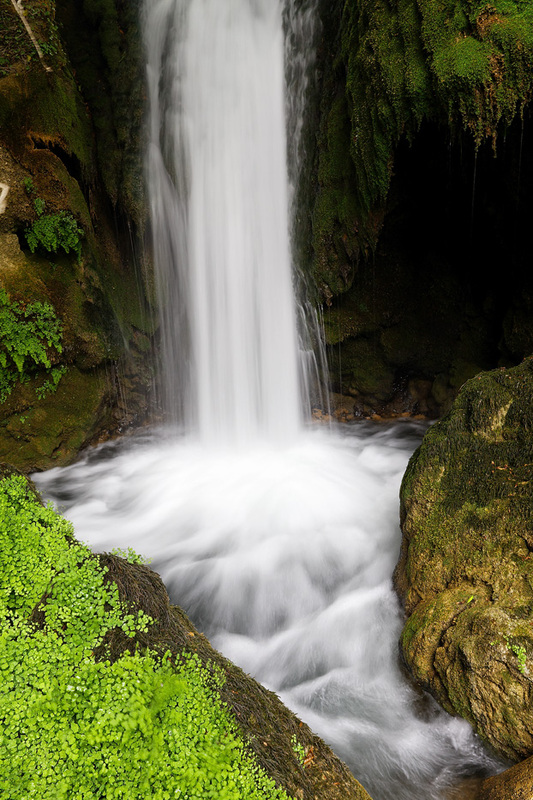 Along its short watercourse of some 17 km, Krupa formed 19 cascades. 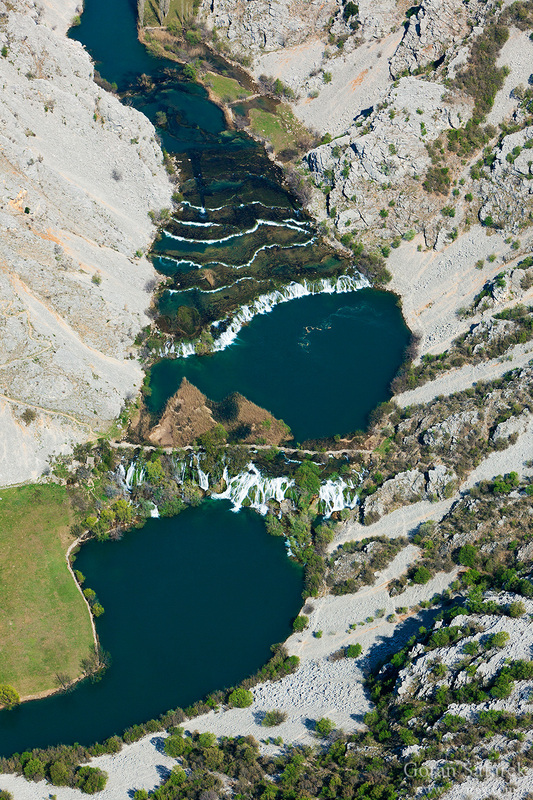 Most of these cascades are well-indented and among the most beautiful in Croatia regarding height and shape. 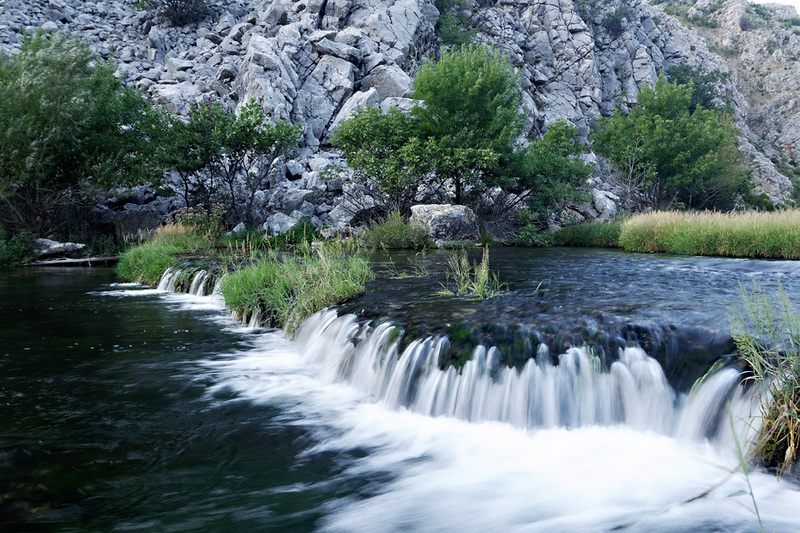 The Krupa River springs from the loose rocks below the Southerneast Velebit, draining the water from the vast rocky region. Very soon, Krupa reaches the Krupa Monastery. Although it was often devastated, the monastery kept many cultural and religious values. It was built in the reign of King Milutin, in 1317. The monastery has always shared the fate of the Serbian Orthodox people in those areas. 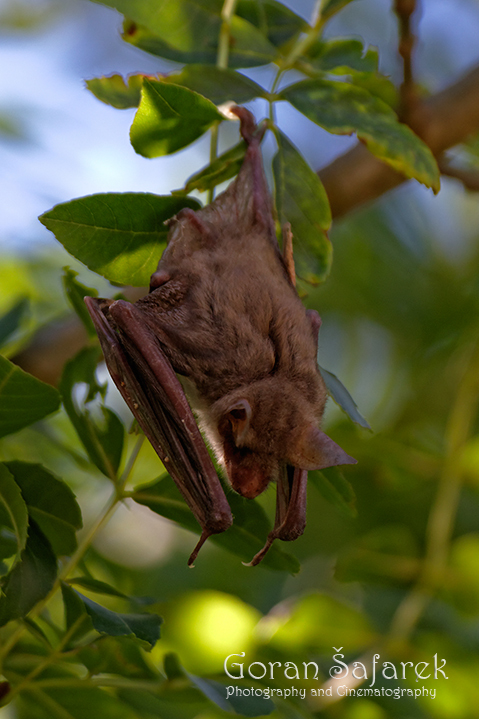 It often suffered in various invasions. Yet it has always been rebuilt. For the first time since the foundation, the monastery was rebuilt in the time of Emperor Dusan, 1345. 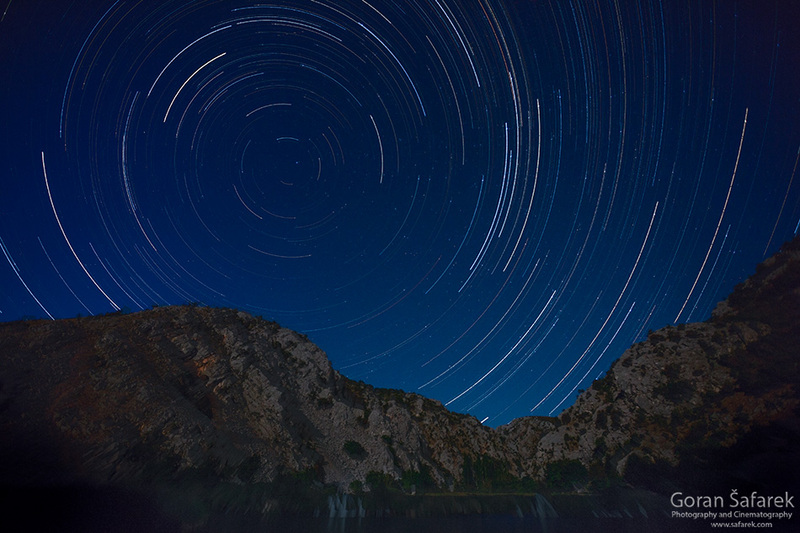 This is evidenced by entry in the firmament of the monastery church. Monastery on Krupa River preserves valuable cultural and spiritual testimony, despite the frequent devastation in the past. 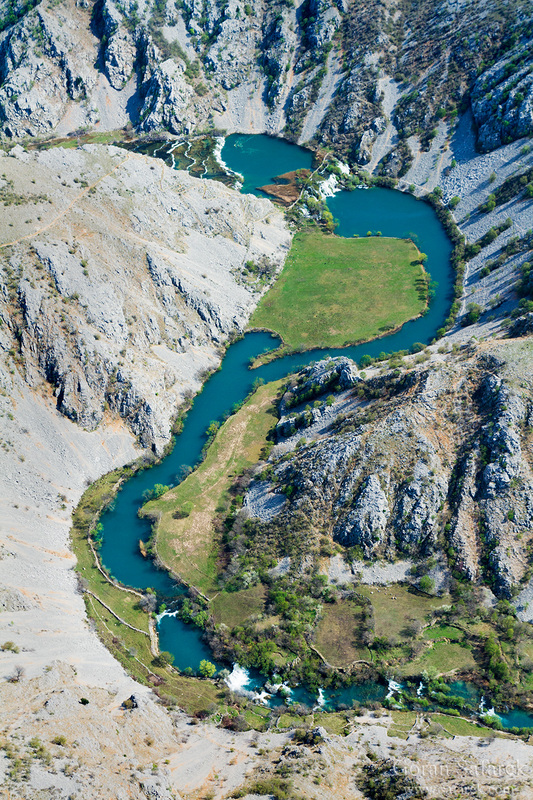 The Krupa River joins the the Zrmanja River near the big waterfall Veliki buk in a spectacular confluence of the canyons. 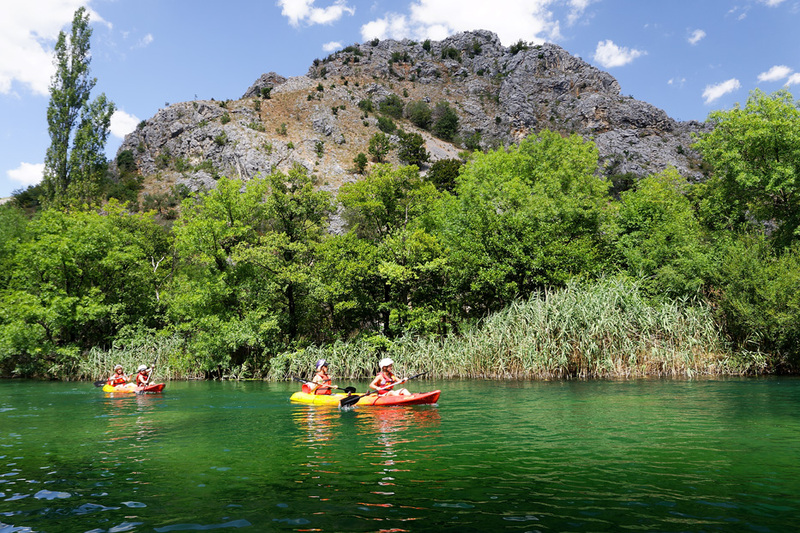 The river, just as the Zrmanja is part of the Velebit Nature Park. It is forbidden to paddle and camp on the river. 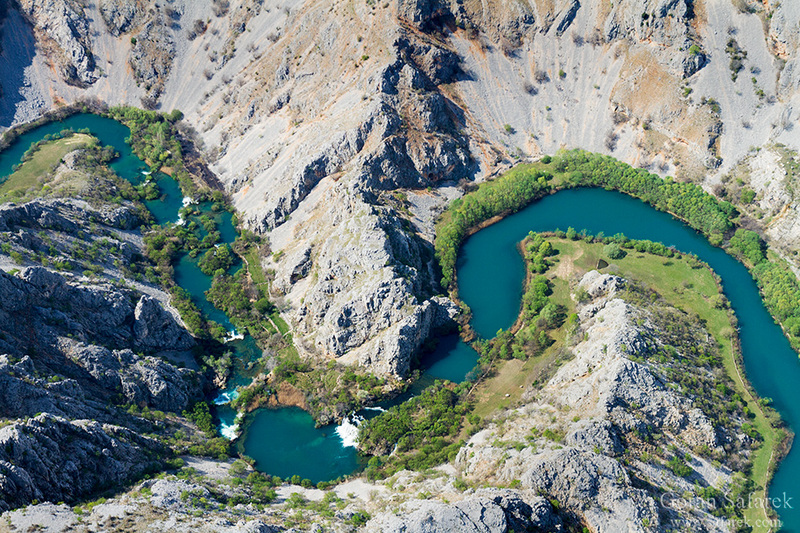 It is difficult to imagine reaching the Krupa River across steep cliffs or rolling talus. 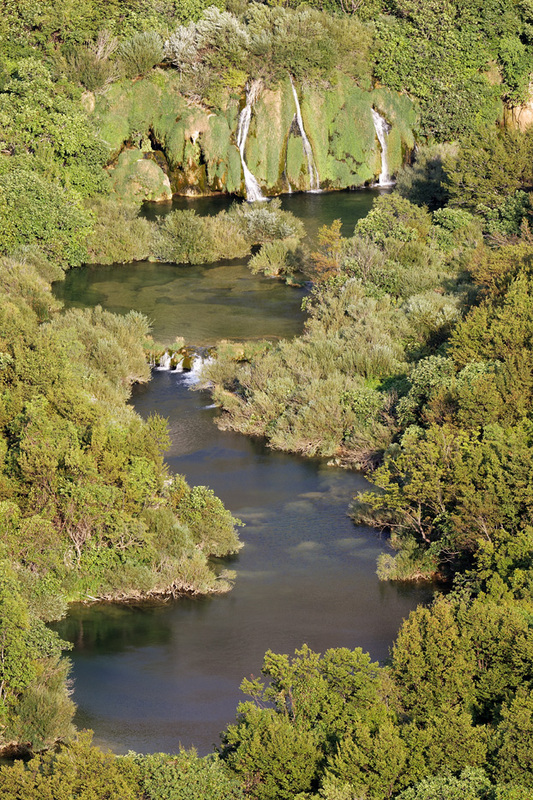 It reminds you of central Africa or Australia, yet it is the wild Krupa River in Croatia. 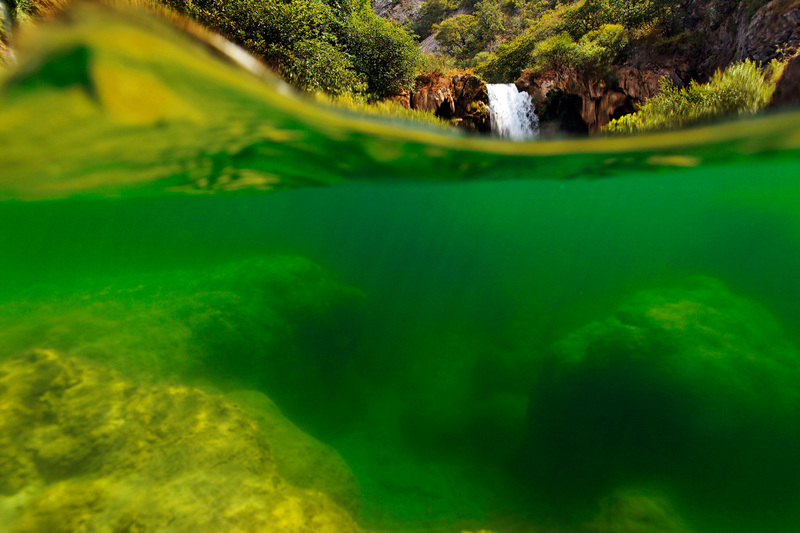 Down there, at the bottom of the canyon, the gurgle of water breaks the silence. Although still out of sight, there is a waterfall hiding around the bight. Indeed, soon trees and shrubs come into view in the middle of the river, a reliable sign of a barrier interfering with its flow. Just two metres away, the river’s might is transformed into a waterfall, a deafeningly loud and foamy downpour falling a few metres down. All is lush, succulent and green with algae, mosses and plants. But also slippery, because the rocks are smooth and round, a stark contrast to the sharp edges of the slopes of the canyon. Much like the Plitvice Lakes – this comparison is not at all amiss, at least as far as the origin of these barriers is concerned. 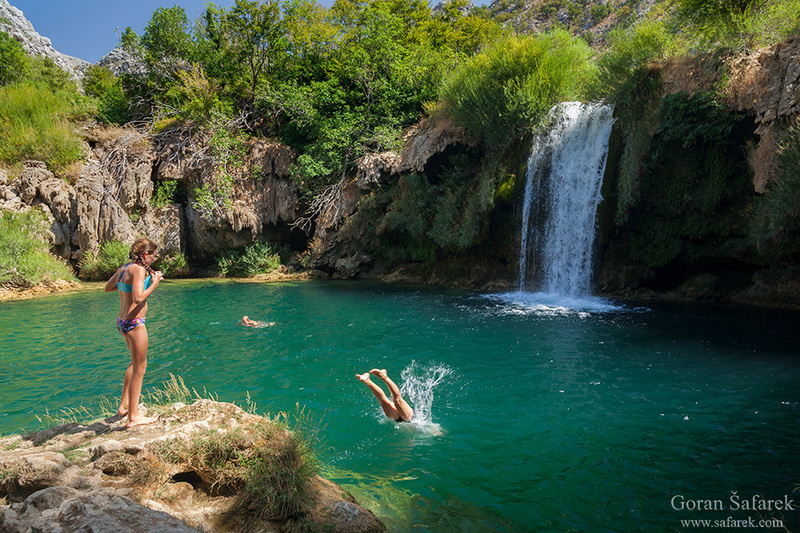 It is the same magical interplay between water and rock out of which tufa is born, an artist that has, by birthing waterfalls, transformed this karst landscape. The presence of water in karst is generally fascinating. 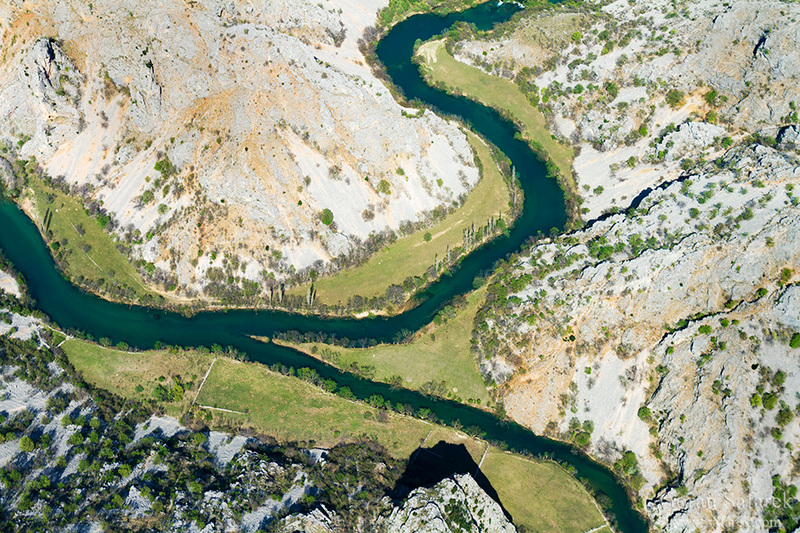 The Krupa River wells from the waterless rugged rock at the foot of the southernmost part of the mighty Velebit Mountain. 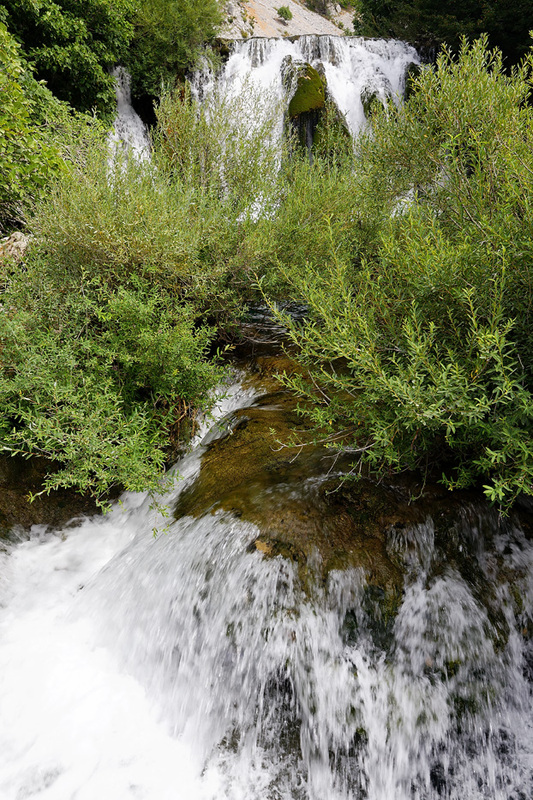 In the summer, water wells only here and there, yet in the spring, it gushes when the snows start melting on Velebit. 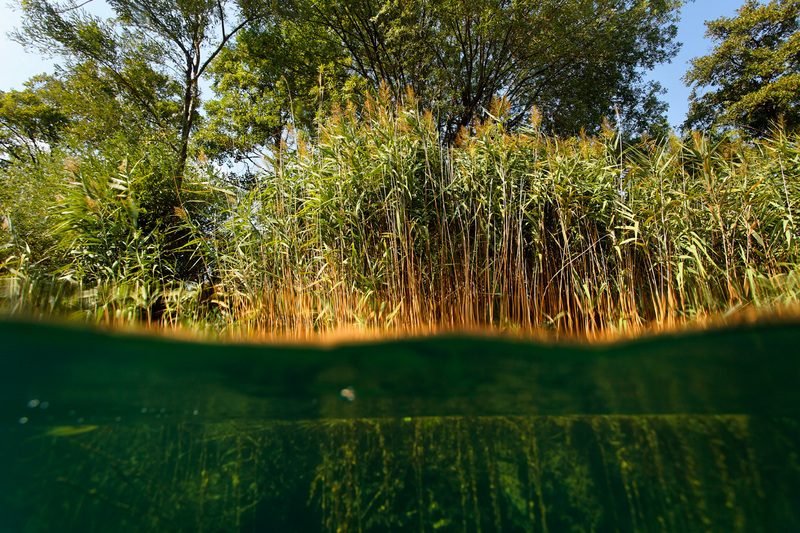 The paths of water in karst are concealed from view, with entire rivers flowing underfoot welling up sporadically in springs. 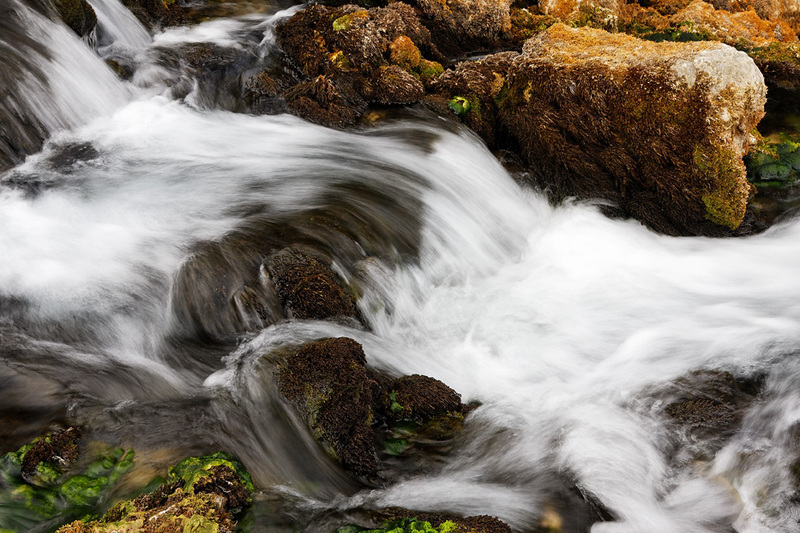 This abundance of water was discovered long ago, with people having redirected this liquid gold to their tiny gardens and mills. 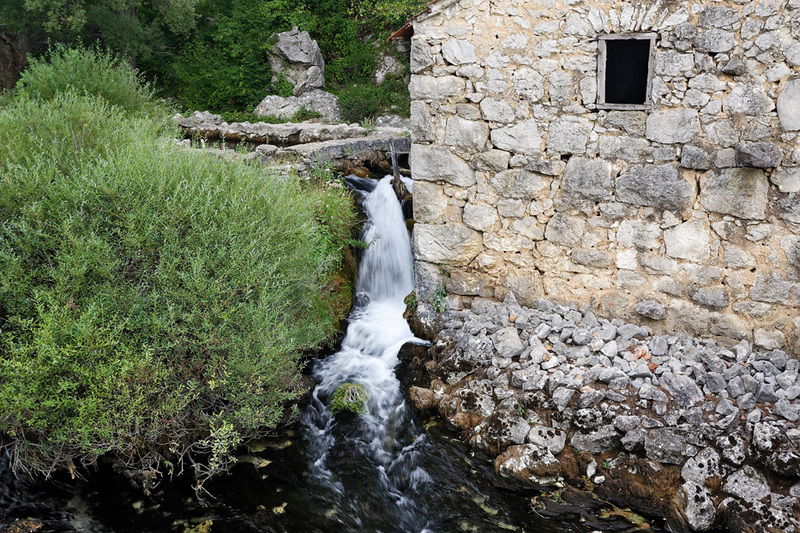 Today, only Uroš’s Mill next to the road works – water spurts from its picturesque stone structure, and so it seems as though it is itself part of one of the spring rocks. A few kilometres downstream, the river expands into an expansive field. 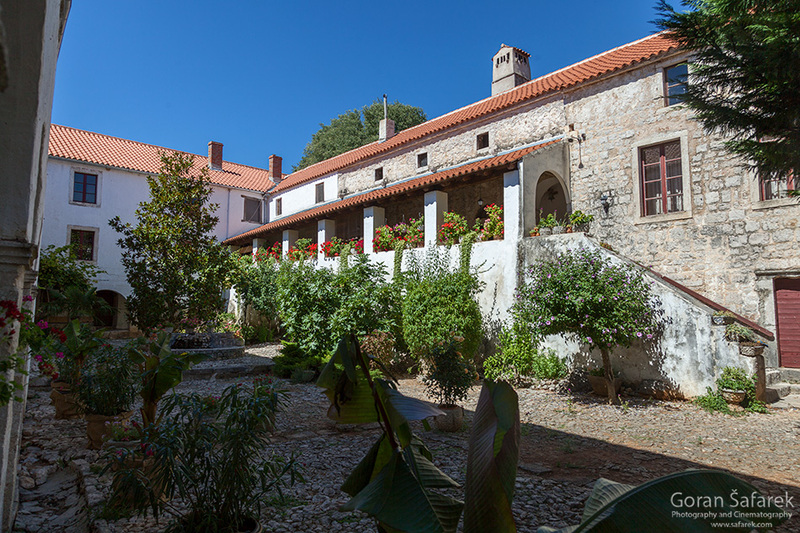 On the fringes of the field, Orthodox monks built a monastery in the 14th century, which has been preserved to date. What is more, the old stone bridge has recently been restored under the watchful eye of restorers. The entire edifice is now perfectly integrated into the environment, with the shade of trees offering chance passers-by a place to rest and freshen up while listening to the murmur of water. At places where there are no waterfalls, the river is slow, it appears to have come to a standstill. 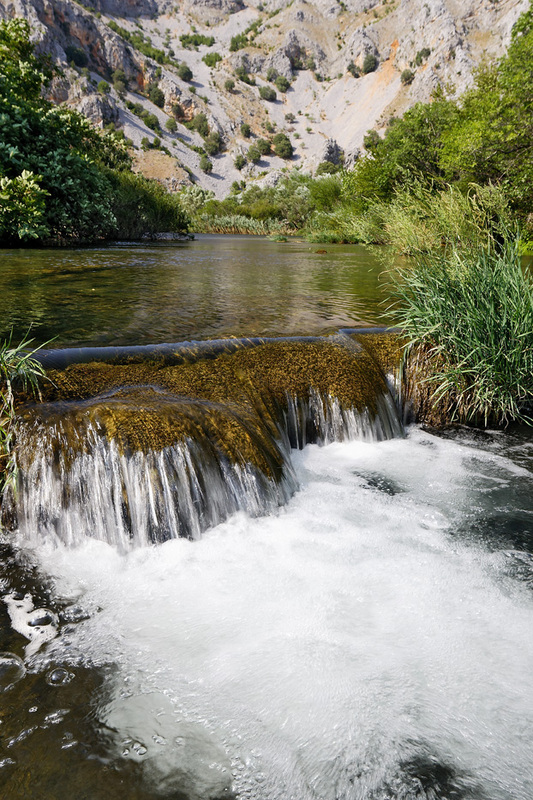 Tufa barriers slowed down the river, having thus created flowing water lakes, much like in the Plitvice Lakes. 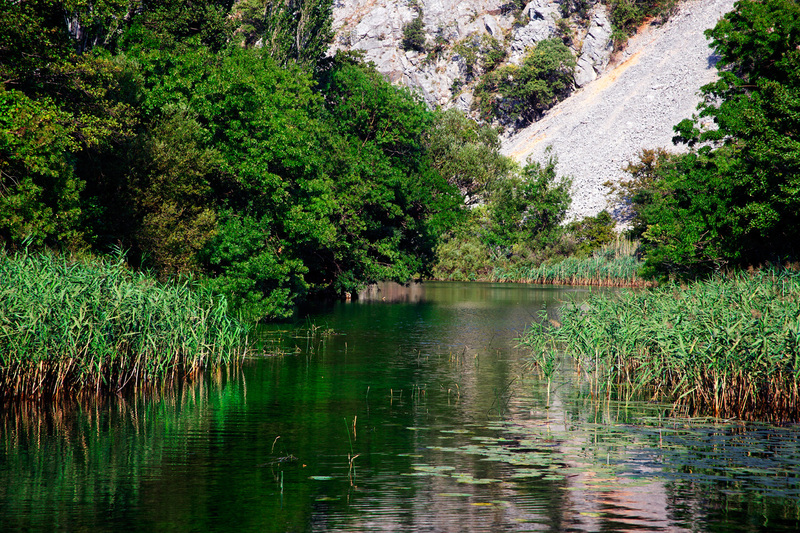 And so, wherever the lake bed is shallow, water lilies, bulrush and other similar wetland plants thrive, right beside rugged rock, in the very midst of the rocky Dalmatian hinterland! 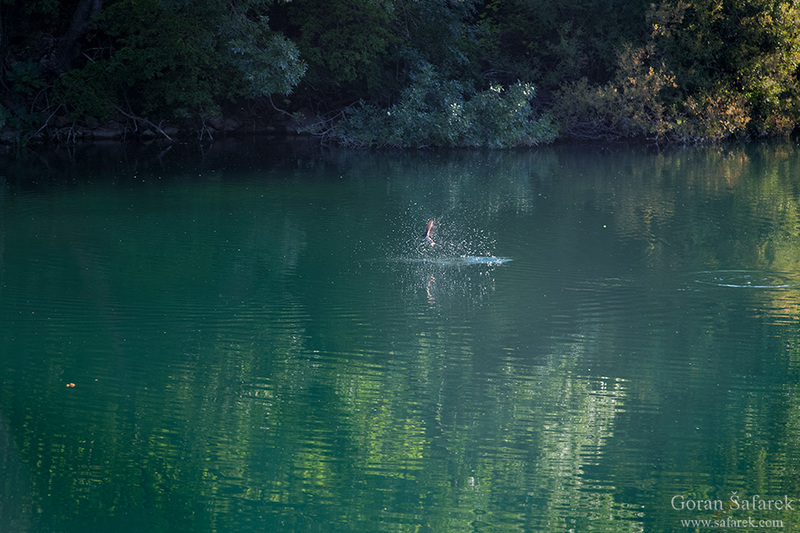 The Krupa River is a green oasis surrounded by rock where your bones will break if you fall over sharp rock, where the thorns of hardy plants will cut you, and where the merciless sun desiccates every drop of water. 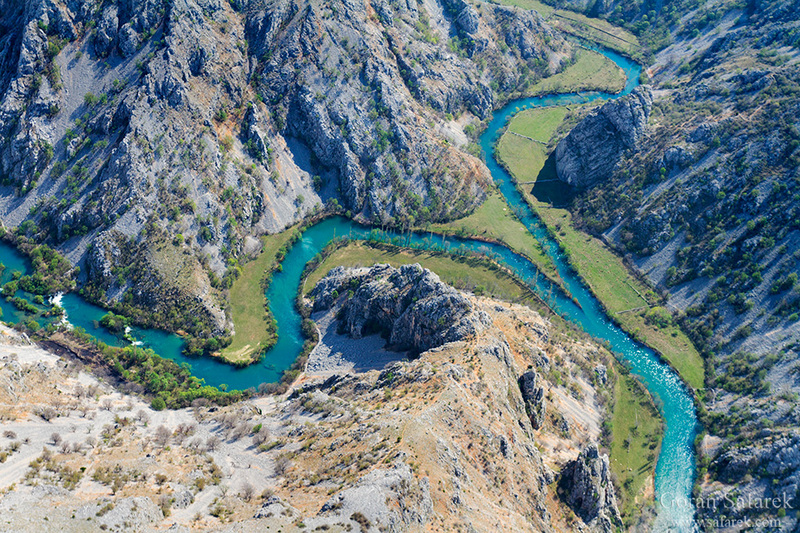 Another canyon opens into the Krupa River Canyon, an even more impressive one – the Krnjeza River Canyon. 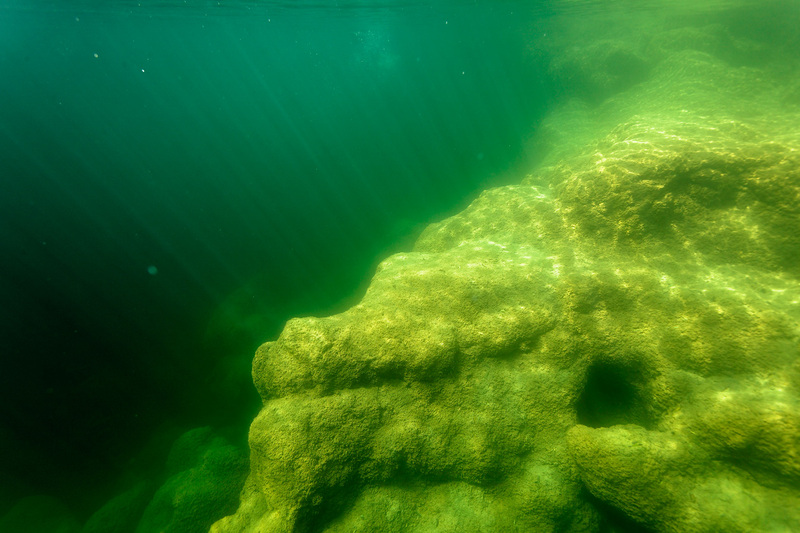 Dried up water moss and pools of lukewarm water with bright green algae bear witness to water having quietened here. During the rains, it must be wild though, for how would it have otherwise chiselled this deep, extremely rugged canyon over the millennia! 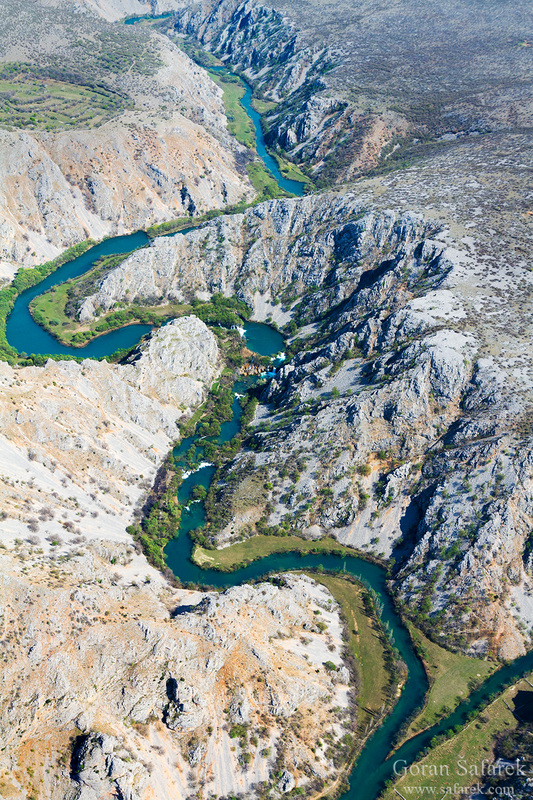 This is one of the shortest rivers – as little as a few hundred metres separate its source from its mouth. 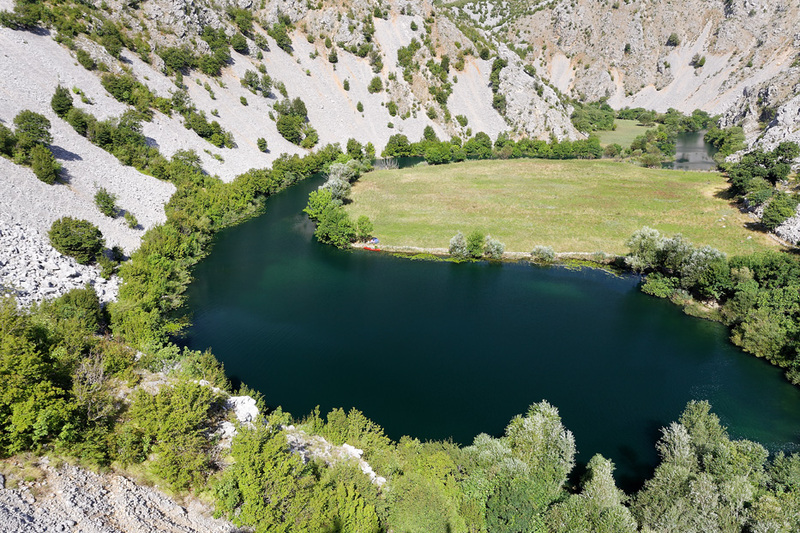 The Krnjeza River wells in a small cave at the very top of the canyon, from a green lakelet hiding in an eternal penumbra. Much like a monster, it waits for the rains to wake it for it to break loose with a torrent. 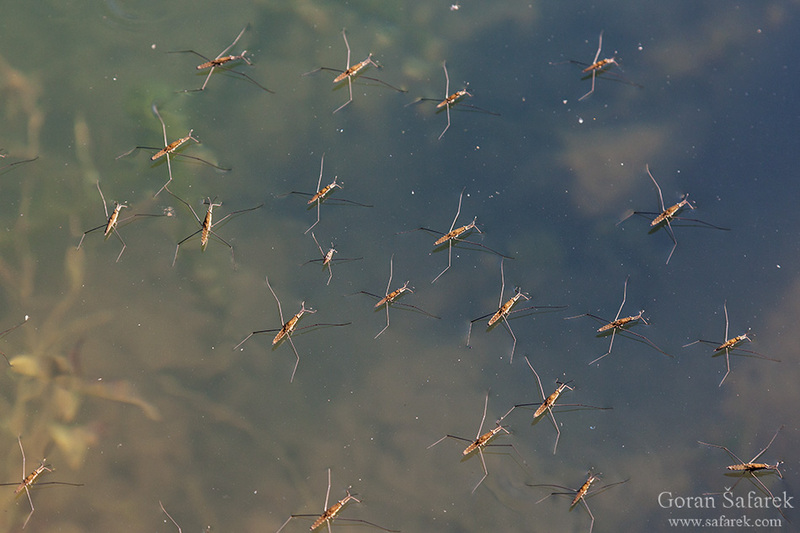 In the summer, the water trickles underground to the river little by little. 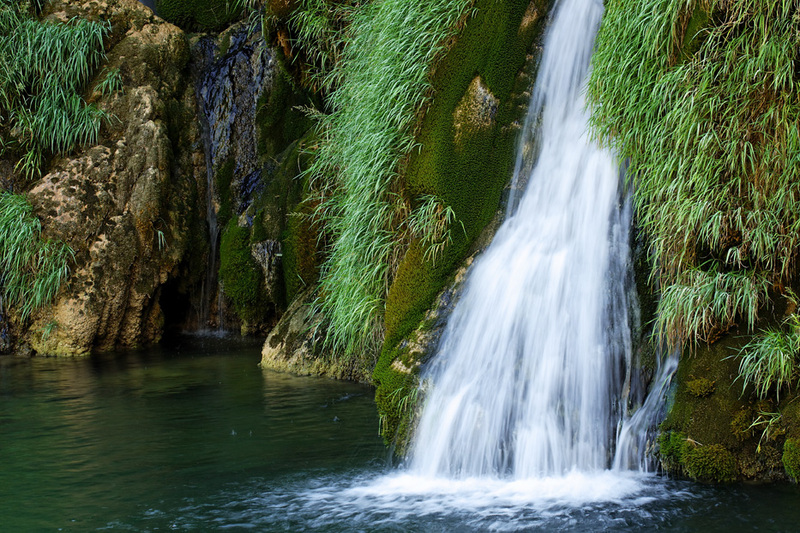 At one point, Krupa flows over natural tufa terraces, nine in total, which is why the waterfalls are called Deveterac (Niners in translation; devet in Croatian is nine in English). By the next waterfall, lush bulrush, willow and fig trees conceal a bridge from view. The legend of Kuda, a young man in love, who built a bridge across the river to reach his beloved, continues to be retold. Whether there is any truth in the legend or not remains unknown, but unsung ancient masters bridged the two banks with twelve small arches using stone and chiselled slabs of tufa. 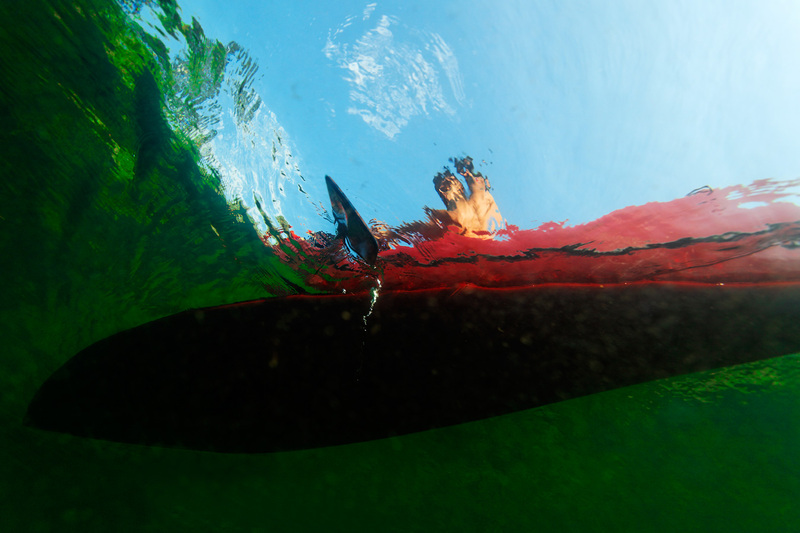 The end result is a perfect synthesis of nature and culture – Kuda’s Bridge. It was once extremely important for people for travel and the transport of goods, perhaps even for love, but never in their wildest dreams could the old masters expect their construction to turn out to be such a brilliant fusion of nature and culture. 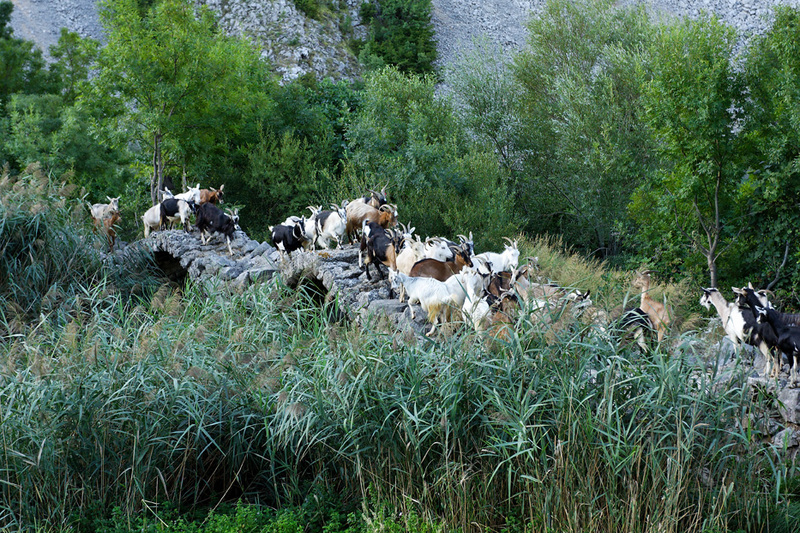 Suddenly, there appear goats that swarm over the bridge, after which most get scattered across the meadow of a tiny alluvial plain in the middle of the canyon. There follows a shepherd. His grey hair and deep wrinkles have left a trace over the decades, although Marko Veselinović still looks after his treasure without any difficulty. And while the bearded and horned herbivores graze, Marko grabs his axe and starts cutting the undergrowth sprouting around the foot of the bridge. There, behind fig trees, a tufa-covered millstone hides, the remains of what was once a mill. Besides being grazed by goats, the meadows used to be mowed, and even crops that could withstand short-term flooding were once sown on these plains. This and other meadows, a true gift from God, were precious for the local community, and so, besides reinforcing the banks with slabs of stone, they planted poplar trees for their roots to further bolster the banks, all with a view to stopping the river from sweeping away even the tiniest bit of fertile land. 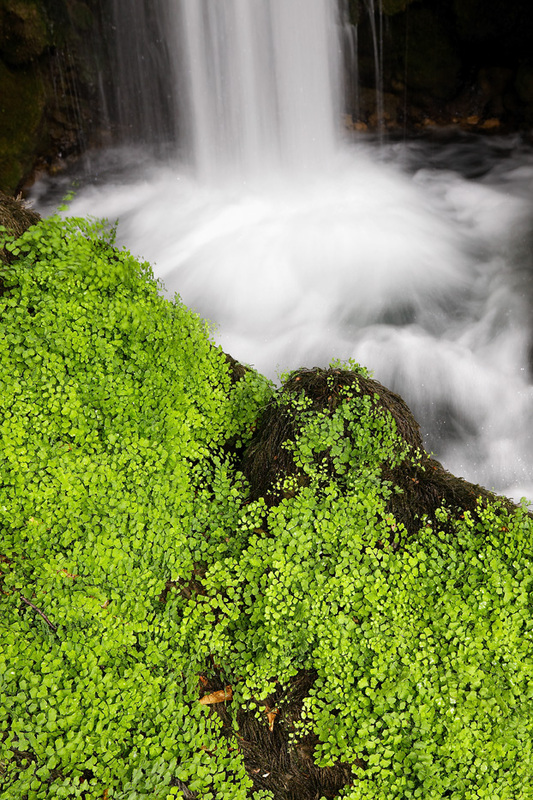 Behind yet another waterfall, the river loses its shape and becomes an uneven landscape spotted with tufa. Here, free-flowing water gets constricted by willow trees clutching at it from the banks, although water wriggles through them from all sides, wilder than usual. 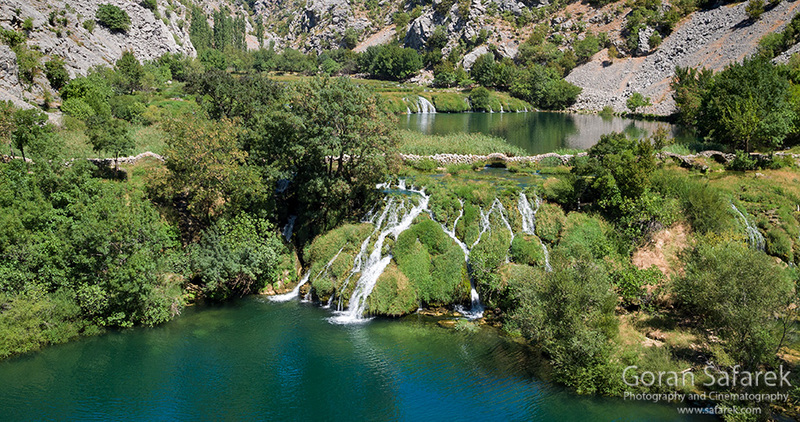 It looks very much like the Plitvice Lakes, although smaller in scale and in the midst of a rugged landscape of the bare rock of the canyon. 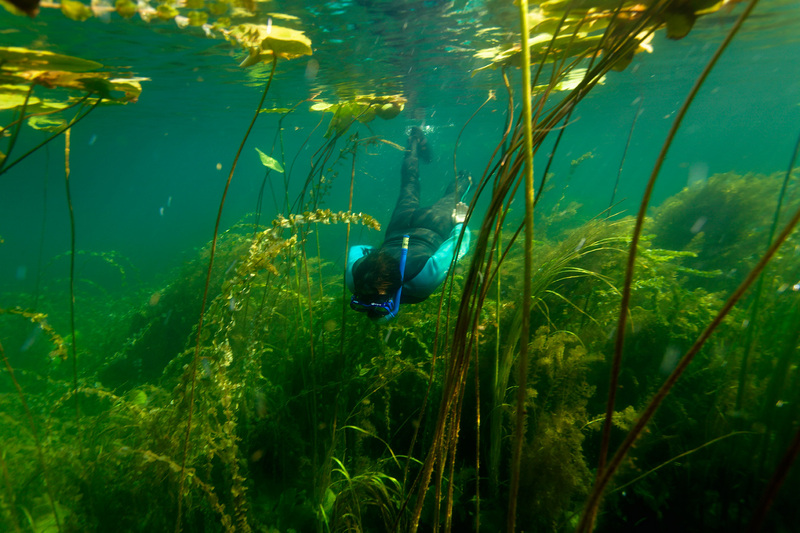 These are perfect conditions for exploring the hidden underwater green world embraced by cold waters. Around the waterfall, water spatters, sprinkles, splashes everywhere, like in a giant washing machine. 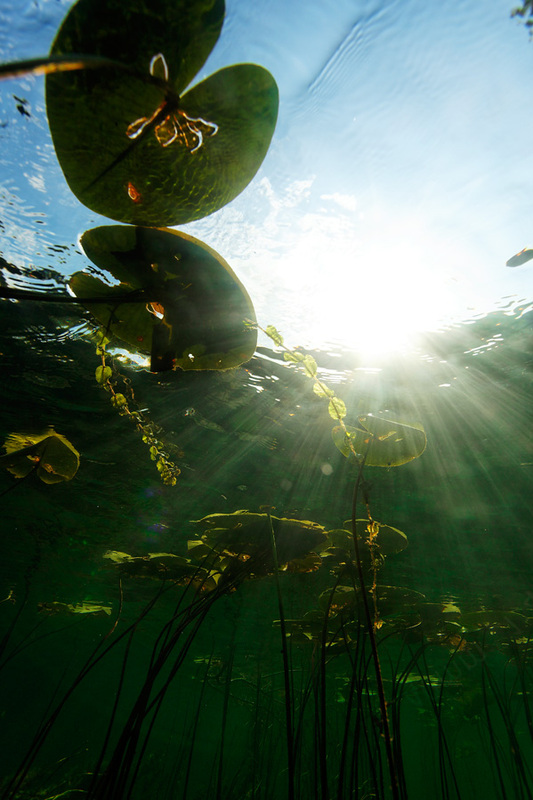 A bit further away, in a stiller part, the river bed is a true jungle of aquatic plant life. 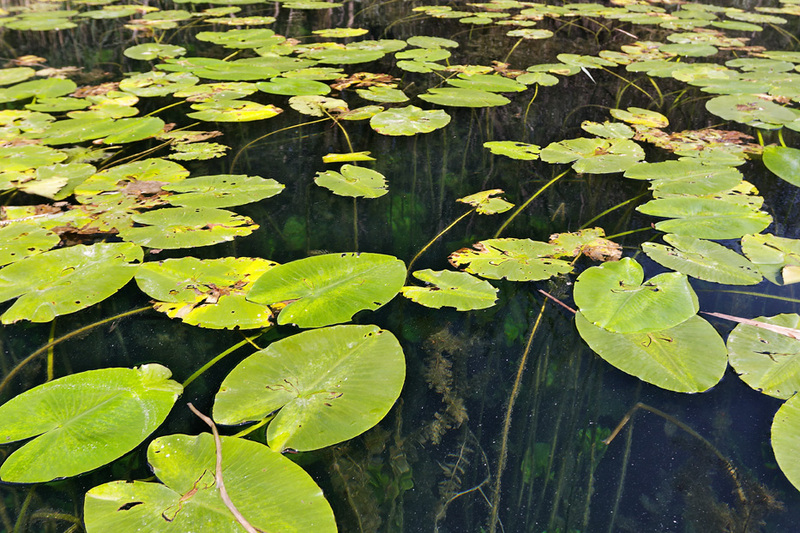 Water lily stems rise like trees from underwater underbrush. 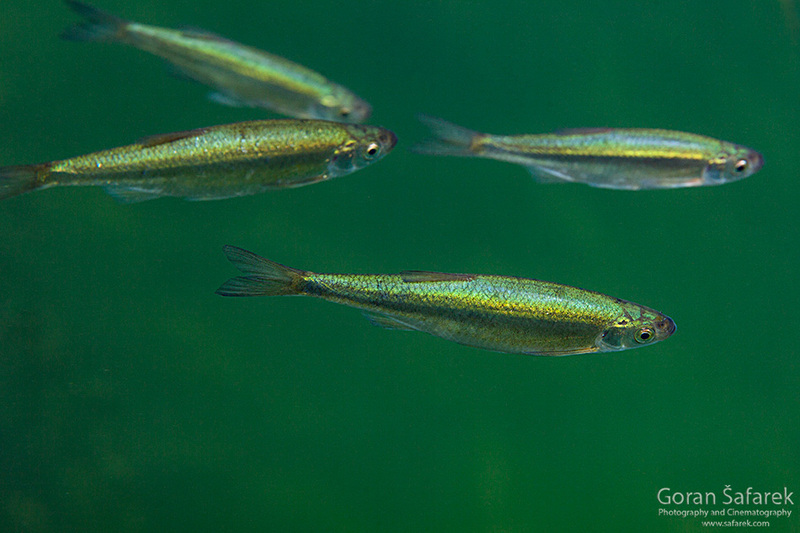 A shoal of small fish swim around them, some of which are endemic and cannot be found anywhere else in the world. Even the most famous botanical gardens could easily be envious of this incredible opulence. 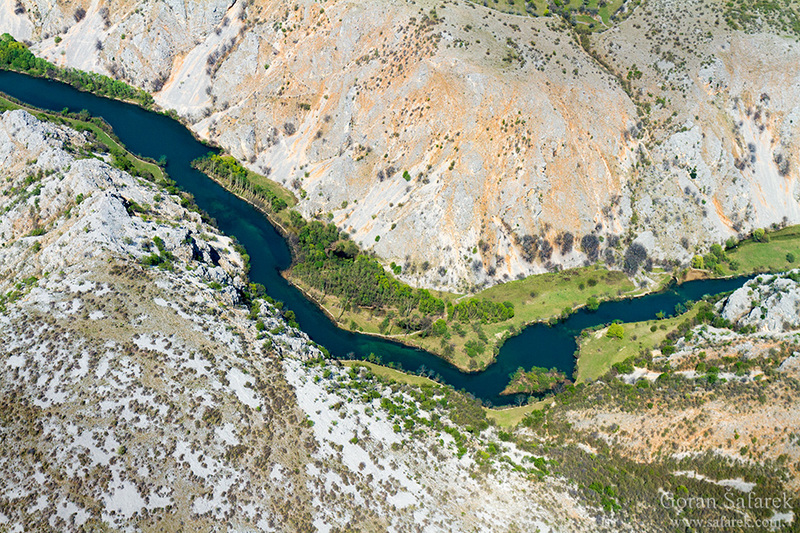 The Krupa River could be reached by the car from mountain road Gračac – Obrovac or from Kaštel Žegarski on the Zrmanja ( where Rafting and canoeing starts). Usually, the starting point is the Krupa Monastery. From there, you can go along the bank. This is rather extreme hike, encompassing the waterfalls, steep cliffs and loose rock. There are several exits and entrance. One of the most popular places is Kude bridge, from Golubić village. You can park at the end of the road, near the house, and from there, you have to descend around 30 minutes. Another trail leads little to the river bit upstream, from the same village, but further the road to Velebit. Drive the sign Vratolom (Break-the-neck) – its meaning says enough how the terrain is there. Both trails are marked.